GROTON, Conn. - U.S. Navy Submarines, and those who have served aboard them during the past 100 years, were honored today when five new commemorative postage stamps were issued by the U.S. Postal Service here at the New London Naval Submarine Base. "The U.S. Navy Submarines stamps pay tribute to one of our nation's greatest technological achievements and they will help remind us of the dedication and valor of our nation's Submarine Force in war and peacetime," said Einar V. Dyhrkopp, chairman of the Postal Service Board of Governors, who dedicated the stamps. Also participating in the ceremony were Sen. Joseph Lieberman (D-CT); Sen. Christopher Dodd (D-CT); Rep. Sam Gejdenson (D-CT); Vice Adm. Edmund P. Giambastiani Jr., Commander Submarine Force, U.S. Atlantic Fleet; Capt. H. A. Lincoln Jr., Commanding Officer, Submarine Base New London; Andy Feindt, Chief Electrician's Mate, Retired, and Connecticut State Commander, Submarine Veterans of WWII; and Jo Saunders, Postal Service District Manager, Connecticut District. Honored guests at the event included John F. Walsh, Postal Service Board of Governors; Mayor Dee Hauber, Town of Groton; Mayor Dennis Popp, City of Groton; Jon M. Steele, Postal Service Vice President, Northeast Area; Michael W. Toner, President, Electric Boat; John Giesing, Retired Electric Boat Pipefitter; Dr. Charles P. Muncatchy, Superintendent, Groton Public Schools; and Michael Tomaszek, Postmaster of Groton. The five U.S. Navy Submarines stamp designs depict different periods in submarine technology and will be available in the first U.S. commemorative prestige booklet, containing text and photographs in addition to the stamps. The 33-cent design will also be available in a separate pane of 20 stamps. The 60-cent stamp design in the booklet features the USS Holland. Purchased in 1900, it was the first submarine acquired by the U.S. Navy. The 22-cent stamp design depicts an S-class submarine showing changes in technology and size that occurred after the USS Holland. The Gato class submarine appearing on the $3.20 stamp represents the contributions that submarines made to American naval superiority in the Pacific during World War II. Los Angeles class fast attack submarines, which will be highlighted on the 33-cent stamp design in the booklet and separately in the 20-stamp pane, are nuclear powered. 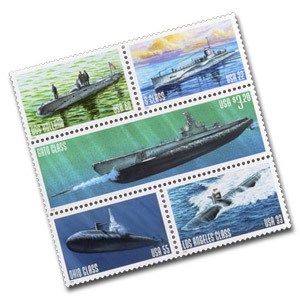 The 55-cent stamp depicts the Ohio class fleet ballistic missile submarine. At 560 feet long with 24 Trident ballistic missiles, it represents an ever present deterrent to possible military aggression. The U.S. Navy Submarines stamps were illustrated by Jim Griffiths of Glenview, Ill. Carl Herrman of Carlsbad, Calif., was art director. The prestige booklet and the separate pane of 33-cent stamps are available today in Groton. Beginning March 28, the pane of 33-cent stamps will be available at post offices nationwide. The prestige booklet will be available only at philatelic centers, Postal Stores and via online or telephone mail order.